provides quality transportation services across the river, and invests in the economic growth of Southeastern Pennsylvania and Southern New Jersey. Making the Philadelphia and Camden waterfronts seem more like an integrated community and less like an international border crossing can also enable economic opportunities. 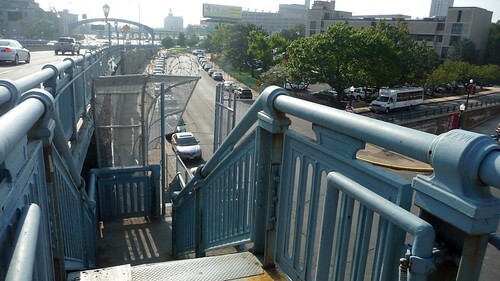 A revitalized walkway could create a new tourist attraction, offer better access to jobs for Camden residents and enhance the quality of life for new waterfront residents and the surrounding neighborhoods. Many a day I think about making a bicycle trip involving the BF bridge and think. "Ew, too much trouble". Especially with a loaded bike weighting maybe 50 lbs or more. And making it more inviting at either end would help entice more people to use it. Snow removal, almost a dream. I use the walkway nearly every day and have marveled in the view nearly every time. Fixing it up ala NYC's "high line" is an awesome idea. Thanks for the push on this.